This thread is a guide to sites that are either dedicated to evolution or have a significant area devoted to the subject. I have tried to stick to what can be recognised as reputable organisations. Sites for a younger audience are often mixed in with teaching resources so they are all there together. This is not a discussion thread please add any comments in the discussion thread! One simple place to start. This little video, exactly 10 minutes long is one of the best introductions to what evolution is and what evolution isn't. Short simple and worth 10 minutes of your time. Howard Hughes Medical Institute 2005 holiday lectures. 4 hours of video on various aspects of evolution, including a fascinating introduction to Charles Darwin; both his work and his life. PBS Wide selection of videos, very accessible, including one about the evolution of the eye. The complete works of Charles Darwin This website is the largest collection of writings by and about Darwin ever published. It contains his complete publications, thousands of handwritten manuscripts and the largest Darwin bibliography and manuscript catalogue. There are also over 200 supplementary texts, from reference works, reviews, obituaries, biographies and more. Darwiniana and Evolution Darwiniana.org is a resource for anyone interested in evolution. It contains information on fossils, genetics, evolutionary theory, botany, zoology, creationism and ID. Extensive links to other reliable sites are provided. It even has a picture of A. R. Wallace. Who was Wallace? Go have a look. Interactive Time Line Very informative interactive time line going back to the Big Bang. It takes a few seconds to load. Unless your screen is quite wide you can't see the right hand end of the line which is our bit. Evolution and the Fossil Record This non-technical introduction to evolution, produced by the American Geological Institute in cooperation with the Paleontological Society, aims to help the general public gain a better understanding of one of the fundamental underlying concepts of modern science. Also has a 36 page booklet. Becoming Human Organisation The Institute of Human Origins (IHO) conducts, interprets and publicizes scientific research on the human career. IHO's unique approach brings together scientists from diverse disciplines to develop integrated, bio-behavioural investigations of human evolution. Through research, education, and the sponsorship of scholarly interaction, IHO advances scientific understanding of our origins and its contemporary relevance. Combining interdisciplinary expertise and targeted funding, IHO fosters the pursuit of integrated solutions to the most important questions regarding the course, cause and timing of events in human evolution. Evolution: 24 myths and misconceptions So here is New Scientist's guide to some of the most common myths and misconceptions about evolution. Evolutionary Psychology Evolutionary Psychology is an open-access peer-reviewed journal that aims to foster communication between experimental and theoretical work on the one hand and historical, conceptual and interdisciplinary writings across the whole range of the biological and human sciences on the other. The Paleobiology Database is an international scientific organization run by paleontological researchers from many institutions. We are bringing together taxonomic and distributional information about the entire fossil record of plants and animals. Our goal is to educate the public, summarize the literature for professionals, and foster statistical analyses of mass extinctions and other aspects of biodiversity. Note: you must register and have a scientific interest in the core data there are some publicly accessible elements. New Scientist Another vast site with lots of recent developments from New Scientist magazine. Last edited by CJ on Feb 26, 2010 4:15 pm, edited 1 time in total. NEW the Human Origins Initiative Smithsonian National Museum of Natural History. A new exhibition hall dedicated to the discovery and understanding of human origins will open next year at the Smithsonian’s National Museum of Natural History. Based on decades of cutting-edge research by Smithsonian scientists, the David H. Koch (pronounced “coke”) Hall of Human Origins will premiere March 17, 2010, which also marks the 100-year anniversary of the museum’s official opening on the National Mall. London's Natural History Museum Welcome to the Natural History Museum. We promote the discovery, understanding, enjoyment, and responsible use of the natural world. Explore our world-class collections, fantastic exhibitions and cutting-edge research online, or visit our landmark buildings. Natural History Museum at Tring Discover the fascinating range of animals collected by Lionel Walter Rothschild in our beautiful Victorian Museum. It is home to the world-class research and collections of the Natural History Museum's Bird Group. The Field Museum of Natural History, Chicago A huge museum which never ceases to please. There are permanent dinosaur exhibits including 'Sue' the biggest T Rex so far found! There are also regular special exhibitions which are detailed on the web site. NEW Downe House, near Bromley in Kent This is the house that Darwin bought and settled down in after his voyage around the world in the Beagle. I grew up 4 miles away and my most recent visit was in Dec 2009. It is a wonderfully evocative place to visit. The ground floor has been restored into its condition as it was around 1859 when Origin of Species was first published. The upper floor is mainly exhibitions of Darwin's life story and his insights into the natural world. His study on the ground floor is such a powerful place to stand. One can almost feel the agonies Darwin went through as he struggled with his beliefs and how his studies contradicted them. The sadness he felt at the death of his first child Anne at the age of 10 is made almost palpable in the extracts from his letters written around the time of her death. He never attended Sunday church services after her death. For me Darwin's early faith makes the work he did so much more credible than if he had been brought up an atheist. I think he knew he was killing God as he wrote Origins. In my experience Downe House lets you get into the mindset of Darwin far better than any TV programme or film that I have yet seen. Standing in his study actually gave me goose bumps. If you ever have a couple of hours to spare and are in the vicinity whatever your world view is I recommend a visit. It is a wonderful insight into the man, his painstaking work and the era in which he lived. Darwin Day Darwin's 200th Birthday will occur on February 12, 2009; it will also be the 150th Anniversary of the publication of his famous book, On The Origin of Species. So, together we can evolve a truly international Celebration to express gratitude for the enormous benefits that scientific knowledge, acquired through human curiosity and ingenuity, has contributed to the advancement of humanity. Understanding Evolution: History, Theory, Evidence, and Implications An astonishingly extensive site with a great breadth of information. Warning there are a number of very explicit images of deformed foetuses towards the end of the site. Also available in hard copy here. The Panda's Thumb is the virtual pub of the University of Ediacara. The patrons gather to discuss evolutionary theory, critique the claims of the antievolution movement, defend the integrity of both science and science education, and share good conversation. Darwin Central is concerned with the theory of evolution as a scientific topic. We do not concern ourselves with either religious objections to the theory or with political objections based on the theory's alleged social consequences. We recognize that some denominations which follow a literal interpretation of scripture object to biological evolution because they feel it conflicts with their interpretation of scripture. There are other denominations that do not share this view. The NCSE's collection of Statements from Religious Organizations consists of a list of Christian and Jewish denominations, including the Roman Catholic Church, that accept (or at least do not dispute) evolution. There is also the recent statement opposing creationism by the Archbishop of Canterbury, leader of the 70-million-member Anglican Communion. We have no desire to participate in such inter-denominational disputes. List-o-links Maintained since 1999 this list dwarfs anything else I've seen. So after you've had your fill here there's plenty more to be found on this link. Plenty of stuff to shoot down creationists with as well. First of 10 videos "Discovering Ardi"
BERKELEY — Nearly 17 years after plucking the fossilized tooth of a new human ancestor from a pebbly desert in Ethiopia, an international team of scientists today (Thursday, Oct. 1) announced their reconstruction of a partial skeleton of the hominid, Ardipithecus ramidus, which they say revolutionizes our understanding of the earliest phase of human evolution. These sites are usually biology based and give insights into the evolutionary process while not being specifically about evolution. New United Kingdom Geologists Equipment I would not normally link to a commercial site but this has a lot of goodies relating to fossils and fossil hunting. Please note: RDF does not endorse this site but offers the link for your information. samar wrote: Last month I had the great opportunity to assist to a 2 day Symposium dedicated to Anniversary of the publication of the Origin of Species. The talks were given by top scientist and most very interesting! An excellent resource recommended by samar. An informative, detailed, not to mention good-looking web resource from the University of Reading, UK, which explains and explores the theory of evolution through the analysis of DNA protein sequence data and by virtual experimentation. "DNA to Darwin allows 16–19 year-old school students to explore the molecular evidence for evolution through practical bioinformatics activities that use data analysis tools and molecular data. The activities on this Web site are centred around an engaging story from recent research in molecular genetics encompassing microbiology, plant and animal biology and human evolution." hackenslash wrote: Somebody posted this at Ratz. One look was all it took, and I knew it needed to be here. Could this eventually be added to the resource thread please? National Evolutionary Synthesis Centre (USA). Blog covering the fossil record of human evolution, from Sahelanthropus tchadensis (circa 7 Mya before present) to the most recently dated fossils can be viewed here. Supplied by Hackenslash. As fire light flickered on the back of the cave, a group of people ate deer, porcupine and otter. Then a man solemnly took a large bone off the fire, broke it in half and sucked the bone marrow out. He then carefully painted the broken bone with red clay and buried it in the cave. He observed this ritual because this bone belonged to another human species. One they shared not only the forest with, but also their beds. This is the remarkable – though so far tentative – picture emerging from controversial discoveries from two caves in south-west China. If true, some think it could overturn our understanding of what it means to be human. Among the discoveries appears to be a primitive human species, which most closely resembles the earliest human species, Homo habilis and Homo erectus. But while these lived about 2 million years ago, this new species lived just 14,000 years ago, says Darren Curnoe of the University of New South Wales in Sydney, Australia, who lead the team behind the discoveries. This would make it the most recent human species to have gone extinct. “If true, this would be rather spectacular and it would make the finds of truly global importance,” says Michael Petraglia at the University of Oxford, who wasn’t involved in the discoveries. Brunet et al, 2002 wrote: The search for the earliest fossil evidence of the human lineage has been concentrated in East Africa. Here we report the discovery of six hominid specimens from Chad, central Africa, 2,500 km from the East African Rift Valley. The fossils include a nearly complete cranium and fragmentary lower jaws. The associated fauna suggest the fossils are between 6 and 7 million years old. The fossils display a unique mosaic of primitive and derived characters, and constitute a new genus and species of hominid. The distance from the Rift Valley, and the great antiquity of the fossils, suggest that the earliest members of the hominid clade were more widely distributed than has been thought, and that the divergence between the human and chimpanzee lineages was earlier than indicated by most molecular studies. White et al, 2009 wrote: Hominid fossils predating the emergence of Australopithecus have been sparse and fragmentary. The evolution of our lineage after the last common ancestor we shared with chimpanzees has therefore remained unclear. Ardipithecus ramidus, recovered in ecologically and temporally resolved contexts in Ethiopia’s Afar Rift, now illuminates earlier hominid paleobiology and aspects of extant African ape evolution. More than 110 specimens recovered from 4.4-million-year-old sediments include a partial skeleton with much of the skull, hands, feet, limbs, and pelvis. This hominid combined arboreal palmigrade clambering and careful climbing with a form of terrestrial bipedality more primitive than that of Australopithecus. Ar. ramidus had a reduced canine/ premolar complex and a little-derived cranial morphology and consumed a predominantly C3 plant–based diet (plants using the C3 photosynthetic pathway). Its ecological habitat appears to have been largely woodland-focused. Ar. ramidus lacks any characters typical of suspension, vertical climbing, or knuckle-walking. Ar. ramidus indicates that despite the genetic similarities of living humans and chimpanzees, the ancestor we last shared probably differed substantially from any extant African ape. Hominids and extant African apes have each become highly specialized through very different evolutionary pathways. This evidence also illuminates the origins of orthogrady, bipedality, ecology, diet, and social behavior in earliest Hominidae and helps to define the basal hominid adaptation, thereby accentuating the derived nature of Australopithecus. Lovejoy, 2009 wrote: Referential models based on extant African apes have dominated reconstructions of early human evolution since Darwin’s time. These models visualize fundamental human behaviors as intensifications of behaviors observed in living chimpanzees and/or gorillas (for instance, upright feeding, male dominance displays, tool use, culture, hunting, and warfare). Ardipithecus essentially falsifies such models, because extant apes are highly derived relative to our last common ancestors. Moreover, uniquely derived hominid characters, especially those of locomotion and canine reduction, appear to have emerged shortly after the hominid/chimpanzee divergence. 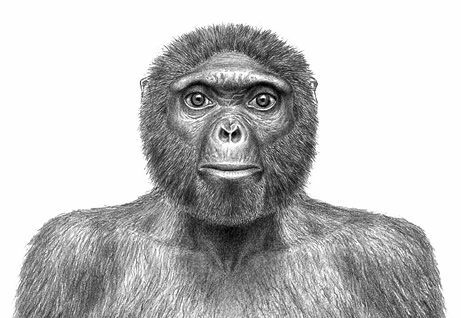 Hence, Ardipithecus provides a new window through which to view our clade’s earliest evolution and its ecological context. Early hominids and extant apes are remarkably divergent in many cardinal characters. We can no longer rely on homologies with African apes for accounts of our origins and must turn instead to general evolutionary theory. A proposed adaptive suite for the emergence of Ardipithecus from the last common ancestor that we shared with chimpanzees accounts for these principal ape/human differences, as well as the marked demographic success and cognitive efflorescence of later Plio-Pleistocene hominids.